Is this Rabbi NI Oelbaum’s FIL? 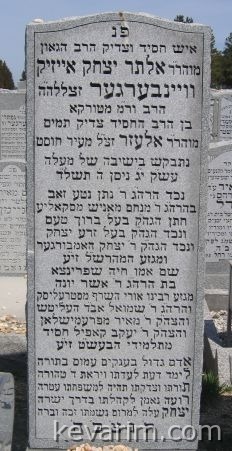 His brother was Reb Usher Yonah Weinberger of Temeshvar-Viznitz, later on in Bnie-Brak. His sister was the Burshtiner-Pudiehzer Rebetzin, mother of the Galanter Rebbe of Williamsburgh and the Burshtiner Rebbe of BP. Reb Usher Yonah Was a Viznitser chusid that lived in Temeshvar, after the WWII in NY, later on in Yerushlayim. R’ Hershele Spinker was also related. His brother (I believe) was known as the “Dreitzener” Rebbe. He survived WWII with all of his children (13). (died & buried in Visho) was their eldest brother. Can anyone advise me how to get information about my Trebitsch ancestors in the old cemetery in Temeshvar? So far I’ve not gotten anywhere. I have the exact grave locations from Geni. I emailed the community there but they were not helpful. He also had a sister Chava Leah wife of Elimelech Miller. Their daugher was married B’zivug sheini to R’ Alter Yitzchok Eizik.